Camden Hayden offers a variety of spacious and modern one, two and three bedroom apartment homes in an ideal Tempe location. Step into chef-inspired kitchens with white quartz countertops, tile backsplash, chestnut cabinetry and stainless steel appliances. Each apartment home also has designer pendant and track lighting, wood plank flooring, full-size washer and dryers, and private patios. Looking to keep your car out of the Arizona sun? We've got you covered. Some apartments have attached garages and detached garages are also available for rent. Plus we've got electric car charging stations available for residents. Just outside your front door, chill with your friends at the heated pool with towel service or take advantage of our one-of-a-kind outdoor/indoor clubhouse. Challenge each other to a game of pool, shuffleboard, corn hole or life-size Jenga. Or impress them with your instagram-worthy chef skills in the gourment outdoor kitchen and BBQ grills with outdoor dining areas. Then, when the sun goes down, get toasty at our outdoor/indoor fireplace. Those desert nights get a little chilly! Say goodbye to the cost of a gym membership because Camden Hayden has a two-story, 24-hour fitness center with cardio and weight machines, free weights, spin bikes, yoga room and an on-demand virtual trainer. Get started planning your next work out by checking out the virtual tour of the fitness center here. Your pets will love it too since our pet-friendly community has no pet weight limit and has a controlled access, off-leash dog park for your best friend along with a pet grooming station. 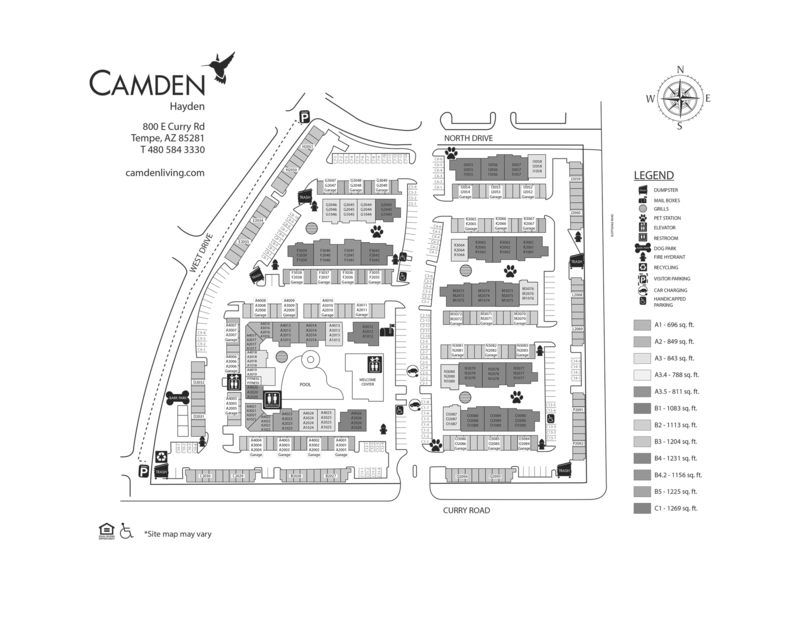 Camden Hayden residents are moments away from popular shopping and dining locations. Head over to the popular lifestyle center Tempe Marketplace for outdoor shopping and entertainment. Scottsdale Fashion Square has the premiere shopping you're looking for with luxury brands and fine dining. For some weekend fun, go to Mill Ave and grab a bite to eat at a sidewalk cafe, do some shopping at a local boutique and grab a drink at one of the local bars. Tempe Town Lake is just a short drive away. Have fun outdoors and take advantage of the boat rentals, walking, jogging and bicycling trails, plus beautiful scenery and natural sights that are over 650 years old! Camden Hayden puts our residents’ safety first, which is why we have joined the Phoenix Crime Free Multi-Housing Program. Residents also receive a technology package included in the total monthly rent with a savings of up to 50% off retail. This money-saving package includes high-speed internet up to 100Mbps and over 280 digital video channels plus HD programming with full multiplex of HBO through Cox Communications. Enjoy one high-definition DCT and remote per unit and one cable modem with an integrated wireless access point. Looking for an amenity-rich community with modern finishes and the perfect location? It's not too good to be true. It's Camden Hayden. Find your new home today! We'll save a spot for you! We offer one covered parking space per one bedroom apartment home on a first come, first served basis. And all two and three bedroom apartment homes include assigned garage(s). Additional detached garages are available for $100 per month + tax. Visitors may park in any uncovered space.